It might surprise many that some of the most cutting-edge R&D in the golf industry in recent times is not actually based on golf clubs, but rather the grips that are installed on them. In the past two years we have seen a plethora of new rubber techniques, new textures, new colors, and the list goes on. It seems 2014 will be no different as Lamkin has again stepped up to push the boundaries of what we believe a golf grip can and cannot be with their new line, the UTx. 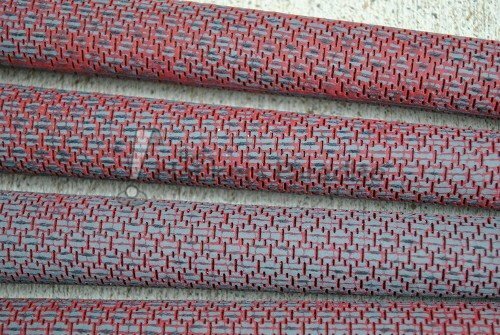 The new UTx grips, at least in the Red and Blue versions, with their combination of patterns, colors, and rough appearing texture have one of the most unique looks we have seen from a golf grip in some time. Undoubtedly some will love the look and embrace the fact that they are a little different, while others may not be so keen initially. 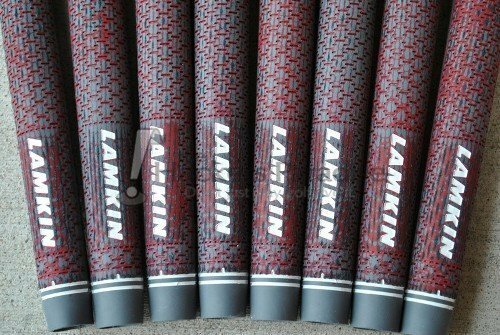 Luckily, Lamkin appears to have thought of this themselves and are also offering the grip in a completely blacked out version which doesn’t show the texture change as vividly as the Red and Blue versions. The unique look of the UTx is the result of two years of R&D in which Lamkin has managed to take three layers of grip technology and combine them into one package. The key to the UTx is the utilization of Lamkin’s ACE 3Gen material (that has been very popular on its own), which has an incredible amount of tack, durability, and vibration dampening traits. Both the inner and outer layers of the grip consist of the ACE 3Gen tech, with the base layer being a softer version to help comfort and the outer layer a firmer version to relieve tension in the grip. Tying the outer and inner layer together is the moisture wicking fabric that allows for more playability in a wider variety of weather conditions. Those aforementioned three layers when combined together provide a unique texture that really is unlike anything else that is currently being done in the grip market. There is enough tack combined with enough roughness that the UTx really stands out once it is gripped on a golf club. The unique appearance of the Red and Blue versions is thanks to utilizing different color materials within each of the three layers while the normalcy of the Black UTx’s is by way of each layer being a uniform color. Lamkin has created an easily recognizable grip here with seemingly endless aesthetic possibilities because of the three layer technology. During review, the UTx’s were put into play in a variety of situations including course time, short game focus, as well as general range. The weather also lent an assist by ranging all over the thermostat from below freezing up to much more typical golfing conditions. There was some moisture thrown in as well. All told, the UTx’s possess a completely different feel compared to any other grip utilizing any type of fabric within their build, so don’t just assume they are a regular old cord grip. The grips walk an interesting line of density, tack, and overall comfort. At no point during testing was slippage an issue. In fact, even in sub-freezing temperatures the tackiness to the grip was immediately noticeable in the bare hands which allowed for lessened tension in the grip. As the temperatures warmed the tack and ability to keep a tension free grip only increased. Understandably with a multilayer design which utilizes different levels of softness and density some may have concerns about twisting. At no point was there any sensation of this however (in any length of swing). As it pertains to durability, the in and out of the bag as well as the prolonged use did not cause any issues to arise. 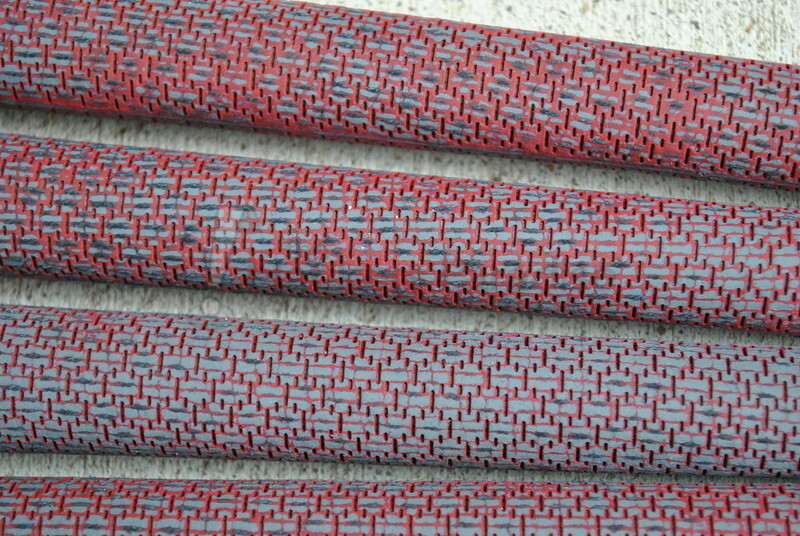 Some fabric could be seen in some areas, but this is completely typical of a grip utilizing such materials. In the past two years it has become clear that Lamkin is intent on pushing the envelope with their R&D and are putting forth a quest to truly improve the golf grip while providing a plethora of different options. With the UTx we are truly seeing something different that is not haphazardly thrown together. The goal is to provide a combination of traditional (fabric weave) and cutting edge (ACE 3gen) and meld them into a grip that can perform in any climate while being enjoyable to use. Lamkin clearly has something unique and effective on their hands with the UTx line, not just from a looks and recognition standpoint but also in performance. The Lamkin UTx grips are available in Red, Blue, and Black and more information on them and the rest of Lamkin’s offerings can be found on their website at www.lamkingrips.com. Great read James! As a huge 3gen fan. I will have these on my clubs this year. No doubt. nice job buddy. I know we were both really intrigued by these at the show. glad to see they lived up to our excitement levels. Fantastic review James. Dare I say I’m having a tough time between throwing these on or keeping my RELs. Love what Lamkin is doing right now. Nice review James! I have been trying these grips out for the last month and they are going to be my grip of choice for this season. Wonderful review, James. 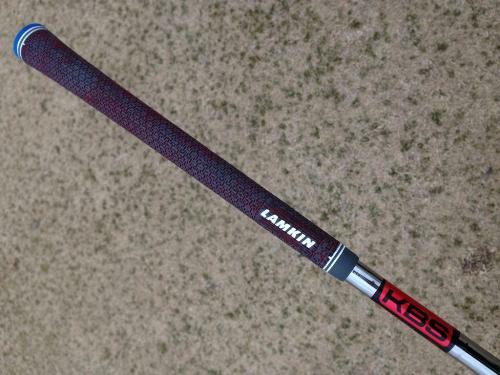 Definitely looking at the Black or Blue versions of these to try out…Lamkin has always made great grips and this one sounds like their best tech yet. Thanks for the review, James. Personally I’m one who isn’t crazy about the red and blue, but all black sounds like a great option. Sounds like a ton of tech packed into these grips. Definitely will be at the top of my list when the time for new grips comes! Good info here James, I’m a fan of the 3Gen so I can see how some will flock to a “hybrid” that offers the softness / shock absorption of the 3gen combined with the standard cord that’s so great with moisture wicking and just some roughness to them. Pretty cool to see grip tech being pushed so much. Love having so many options. Great review James. My preference is for the Winn Dri Tac becuase of how soft they are, but these really interest me. I might have to throw one on the wedge and see how I like it. As a long standing REL user/believer, I am really excited to hear about the success of UTx James!!! I appreciate you touching on the two things that factor most for me: durability and tackiness. Sounds like these are a real winner in all weather conditions. Another fantastic review. Well done my friend. I really love what I’m hearing about these grips, with the humid weather around here in the Midwest, these are a top my ponder list for a regrip! Great info and real life input James! Have had one on my driver for a bit and looking to see the varied temps and moisture performance. Not a corded grip guy and these feel fantastic so far! Well done James. I absolutely loved the Crossline Ace so I know I will have to give these a look. Great review Jman, huge fan of Lamkin grips, love the design, looking forward to trying these out. Really liked the review James. 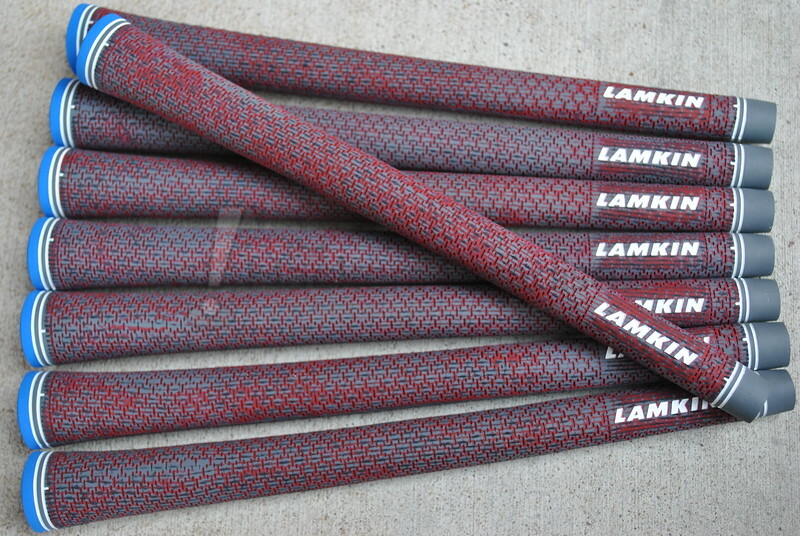 I definitely like where Lamkin is going here and I intrigued by these grips. I picked up a few for my wedges and will be putting them in play this weekend. Looking forward to seeing first hand what these grips are all about. They sound awesome. Not a fan of the looks from these pics though. Nicely done, Jman! I have been gaming these for since they first came out earlier this year. Have about a half dozen rounds in with them and they are the best grips I have used. I was a NDMC fan but these have swayed me. The feel, texture, tackiness are a great combination. I am in the market for grips,and these have my attention. I am definitely going to check them out in the stores.